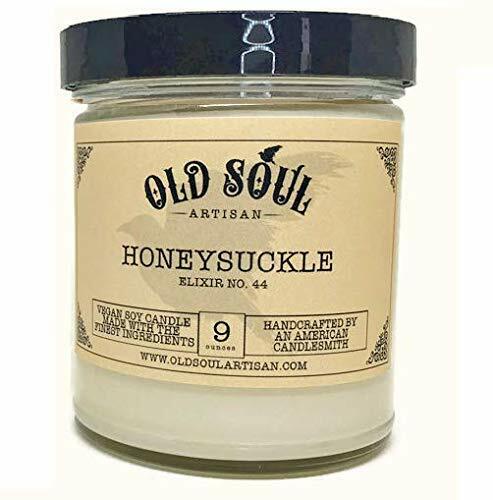 This listing is for a hand poured Honeysuckle scented soy candle. These sweet nectar flowers release the most wonderful scent. This fragrance will remind you of cool summer nights with sweet honeysuckle wafting through the breeze. Our soy candles are vegan, naturally dye-free, made with 100% soy wax, lead-free cotton wicks, and are perfectly scented with an essential oil and perfume oil blends. This is a handmade item made using the finest candle ingredients possible. Each of our candles is hand poured in a small workshop in New Jersey. Thank you for supporting small businesses! ** TIP: To enjoy your candle longer, we recommend not burning for more than 4 hours at a time and to trim the wick between burns. Let your candle melt pool reach to the sides of the jar each time you burn to ensure an even burn throughout the life of the candle.